DRAFT ANALYSIS: "Exciting goal kicking winger with ball winning ability and pace"
Hayden Sampson is a winger/midfielder that can also play as a small forward. He was a member of the South Australian National Championship winning team. Sampson has an ability to get out of the contest at pace and break the lines with devastating impact. Also when playing in the midfield he was seen in the lead up and during the champs to burst from the centre clearance and drive the ball inside 50. Playing for South Adelaide, this year Sampson has been in the Under 18s, Reserves and also made his League debut after returning from the National Championships. In the recent U18s Grand Final he finished with 23 disposals including six clearances and five inside 50s to showcase his game. His speed, ability to find the football and take the game on are highlights of his game, while he does have a couple of improvements to work on, including his decision making and efficiency by foot. Sampson’s ability to cleanly pick up the footy and explode from the contests is noticeable, often breaking clear of the packs to help create chaos for opposition defenders. With obvious pace, thanks to his father Clay Sampson, the former Dee, Crow and Tiger, Hayden uses this attribute to escape from the contest. This speed both helps him with and without the ball, as he can gain an extra few metres on his opponent whether he is trying to create separation, or close down the ball carrier. Sampson also likes to drive the ball deep and with ball in hand will kick the ball long on many occasions to give his forwards the early edge. To do that you need a certain confidence to take them on and then deliver, which he has. Sampson can also hit the scoreboard and at more senior levels would be a very hard to handle small forward as he can not only pressure the defender, but can also find the goals. His defensive pressure and ability to still kick multiple goals make him an ideal small forward at AFL level, while also being able to pinch hit in the midfield. He still has some areas of improvement, but he has some really attractive offensive traits. There are two areas in which Sampson can continue to develop his football. Firstly, Sampson can sometimes choose kick over handball, and can improve by ensuring that he continues to bring his teammates into the game with him, specifically when coming out of the packs. As he has the tendency to kick first, he can sometimes rule out a couple of other potentially more beneficial options, looking to go long rather than opening up the space laterally, which on some occasions can be a better option. As part of kicking long in his midfield clearance role, it can lead to a quick kick out of congestion, which creates chaos, but can also be inefficient. If he shows more composure with ball in hand in these situations it will allow him to showcase his good kicking and hit-up teammates. Overall his efficiency can improve when under pressure, but given time and space, Sampson can be dangerous with ball-in-hand. Hayden Sampson is a goal kicking winger in the mould of Tigers Shane Edwards and can rip apart games using his clean hands and explosive pace to break lines and slot goals. 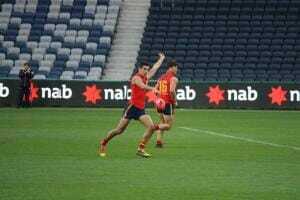 He seems an underrated prospect coming out of South Australia, and is likely to play as a small forward at AFL level to begin with, and potentially move into the midfield later in his career. His terrific athletic traits and both class and defensive pressure inside 50 make him an ideal candidate to fill the void inside 50 at an AFL club. He could improve his decision making and efficiency under pressure when in the midfield, but both are areas which will undoubtedly be a focus once he reaches the elite level.